Pygmy Hedgehogs are not your average pet, yes they’re cute little companions that are entertaining, fun and pretty low maintenance, but they do have unique behaviours and special requirements. Below are some points to consider before you buy. Some people can be allergic to these little guys! It’s likely you will already know if you have animal allergies, so when you’re visiting breeders, get close to these animals to test out whether you are allergic to their saliva, dander, urine or bedding. If you’re in the United States, check whether your state allows you to keep African Pygmy Hedgehogs (your new little friend could be confiscated and euthanized if you’re not). Pygmy Hedgehogs have their own unique behaviour and personalities. You must remember that they are wild animals that are raised domestically and can be tamed. Some are sociable and will sit on your knee while you watch telly and some will always be on the move, not having any interest in bonding with you. Some hedgehogs may never be completely tamed. They like to sleep during daylight hours but at night they’re very active and can be a little noisy foraging around and running on its exercise wheel. You’ve really got to be convinced that an Pet Hedgehog is right for you. Consider obligations you may already have or events coming up such as changing jobs, moving house, getting married, going on vacation and make sure you’re 100% ready to bring one into your home. 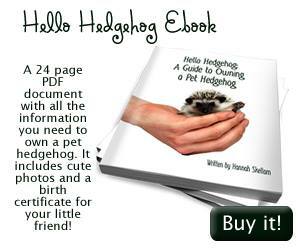 Pygmy Hedgehogs chose to be solitary but they can be around other pets. If you chose to introduce another pet to your hedgehog be very careful, don’t ever leave them alone together and make sure your hedgehog isn’t frightened. Hedgehogs are not ideal pets for young children because young children have little hands and the prickly spines can hurt them. 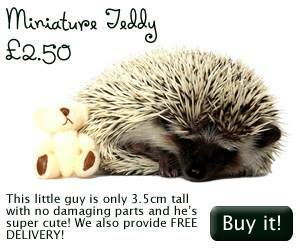 Children can accidentally drop hedgehogs which can cause serious injury. Very rarely, a frightened hedgehog can nip a child. It’s a good idea to select a vet before you buy your hedgehog. This means if there is ever an emergency, you won’t waste any precious time having to search for one. It is also a good idea to choose a vet who specialises in hedgehogs and is located near to you. It’s a bonus if they do house calls and sick hedgehogs can get stressed out travelling. If your cute friend does get sick, make sure it is seen straight away. They are generally hardy animals, but if they do get ill, they very seldom get better on their own. Pet hedgehogs can vary in price, and so can all the items they need such as housing, bedding, food, space, accessories and veterinary care. You will find a list of everything you need on this website. Make sure you can afford to give your new companion everything it needs. In the UK hoglets are priced between £100-£125. On top of this you will need to pay for it’s accommodation, food and items to enrich it’s environment. Expect to pay at least £250 in total – including thebaby hedgehog itself, however, once everything is bought for your little friend, bills are pretty low. You might need to buy new bedding every now and then and you’ll certainly need to buy more food, but luckily for our bank balances they eat such small amounts! After the initial payments you will probably find the biggest cost is vet bills… IF you ever need to take him/her to the vet! (African Pygmy Hedgehogs don’t need any vaccinations of flee treatments so will only ever see a vet if for some reason they are ill or injured).